Uglyworld #2035 - Uncle Benz Rices Arena - (Project Cinko Time - Image 237-365), a photo by www.bazpics.com on Flickr. 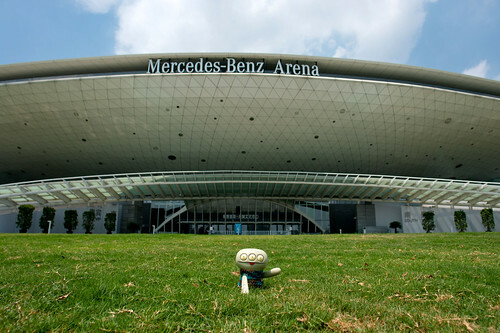 Cinko: "Tells me again why this is Uncle Benz Rices Arena"
Baz: "Well we are in China aren't we?" Baz: "And chinese like to eat lots of rice, don't they"
Baz: "Where else would be the best location to sell rice to the millions of people who live in Shanghai than such a huge arena!" Cinko: "Hmmm, but why does it say Mercedes-Benz?" Baz: "Simple, they contract Mercedes to deliver the bags of rice!" Cinko: "If you says so, but I'm not convincereds yet, I'm off to askers to speaks to Mr Benz right now, is you comings with me or nots?"